Selecting Total Basement Finishing to install Total Basement Finishing's basement finishing system is a choice of long-lasting beauty and value for your newly finished space. Our goal is to provide and install quality basement finishing materials that have been designed specifically for the basement environment, so they'll last for decades to come. While there are cheaper alternatives to our system on the market, we've developed, researched, and tested a basement finishing system that we believe offers the most valuable return on your home improvement investment. For a free, no-obligation basement remodeling estimate, call or contact us online today! 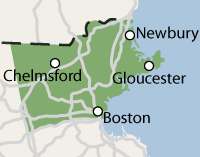 Total Basement Finishing proudly serves Massachusetts, including areas surrounding Cambridge. Total Basement Finishing would like to offer a free, no-obligation visit from one of our basement finishing specialists, who can visit your home and help you decide on the best basement finishing plan for you. Our specialists are trained and certified at the Total Basement Finishing international headquarters in Seymour, Connecticut to ensure that your service is of the highest professional quality. Your representative will conduct a professional assessment of your basement and make recommendations of effective options for your project. We have a flexible basement finishing system, including a variety of options for your basement flooring, finished walls, drop ceiling, and energy efficient windows.